I got a new tattoo! With The Tethering paperback being officially available to the general public, I decided it was time. The tree of life is a very important symbol in The Tethering series. Not only is it featured in the cover art, but it is also the crest of the Gray Clan, the family which my protagonist ends up joining. I know you may think getting a tattoo to mark my first novel may seem a bit extreme, but this is a huge accomplishment. One that can never be taken away. And now for the rest of my life, that pride is etched into my skin. And my husband’s. 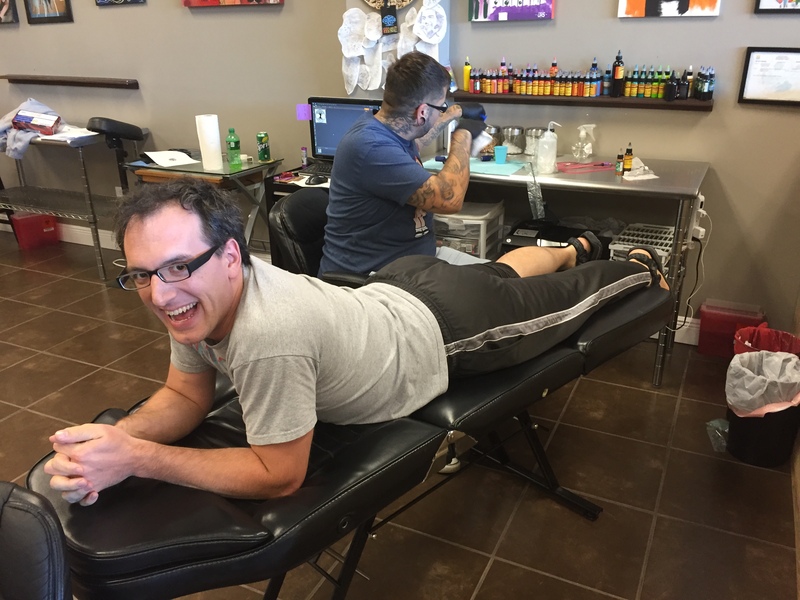 Cause he decided to get a tattoo, too! The top of the foot is NOT a pleasant place to get a tattoo. But it doesn’t so much hurt as it feels like nails on a chalkboard in your skin. He looked at me like I was wasted and said, “What?” in his grumbly tattoo man voice. I realized he didn’t know what err meant, wanted to run for the door, realized my husband already had his tattoo and that I would be a horrible wife if I abandoned him. And his tattoo went well, so maybe it didn’t matter if the artist didn’t have a strong vocabulary. Then I crawled up on the table, had my foot pummeled with a needle, and now I have a lovely tattoo. And I am glad he erred on the side of light brown. Congrats on the book Megan. Heheh, that’s a funny story behind your tattoo. Cool tree of life you both got, nd I really do like the browns!